By David Rodnitzky on 07/28/2009 in "Analytics Blogs"
1. The spokesman, Ed McMahon, is dead. 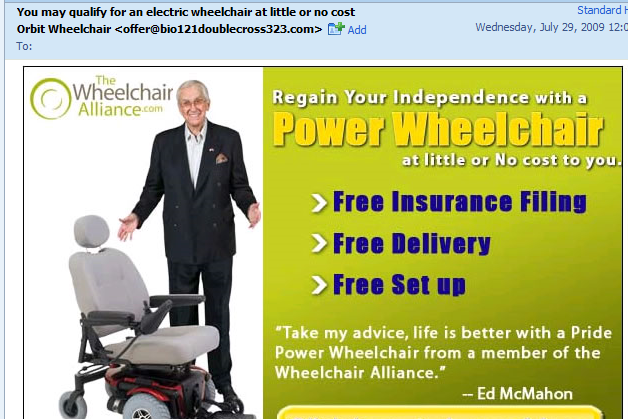 And his quote says “Take my advice, life is better with a Pride Power Wheelchair . . .” Maybe he is referring to that famous Eric Clapton song “Wheelchairs in heaven”? 2. Seems like a bad idea to use the “from” email address “offer@bio121DOUBLECROSS323.com.” Hey, look, another offer from Double Cross – must be a good one! Published on 04/22/2019 in "Featured Blogs"